Everyone knows that the tastier a dish is, the more fattening it probably is. All the best foods are generally the worst for us. And while we know it’s best to avoid such food groups, doing so can be almost impossible at certain times of the year – and with Christmas nearly upon us here in the UK, the sweet treats are starting to look ever more appealing. Some of our favourite sweet treats include deep-fried Mars bars from Scotland, churros from Spain, poutine from Canada, Nutella crepes from France and tiramisu from Italy. But one of the sweetest and most loved dishes comes from India and is known as jalebi. This sweet food is popular in a number of countries, from India, Pakistan, Nepal and Bangladesh. It is a deep-fried sweet soaked in a sugary syrup, usually served as part of special occasions in the country; from weddings and birthdays to other big, public parties, like festivals and national holidays such as Independence Day, Republic Day and Ramadan. These sweets are really easy to make, which makes them all the more appealing. The recipe for jalebi can be traced back to ancient India, but back then it was known as kundalika. It features in 13th Century cook books, and in the 1900s it was commonly used to hold ice cream before cones were invented. It is even thought to have medicinal properties and has in the past been used to treat headaches. Jalebi can be made easily at home and is enjoyed by families across the country, but it is also often sold by street hawkers. In Gujurat it is usually eaten with sambharo and friend chillies for breakfast – making it a truly versatile sweet. When you look at jalebi, you might think it looks a lot like a large pretzel. It is usually bright orange or yellow and has a crisp, flaky, caramelised outer shell that surrounds a dough rich in sugary syrup. It is the process of deep frying and the sweet syrup that makes jalebi so bad for us (but too good to resist). It can be served hot or cold. This sweet is so popular in India that it can be found at almost any sweet shop. 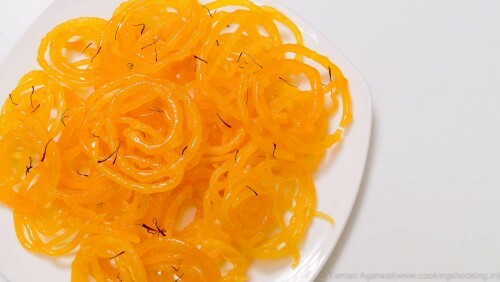 There are a number of jalebi-esque sweets that are really popular too, like imarti – which is enjoyed mainly in the northern states – and zangoola, a sweet popular in the Middle East. So if you’re looking for a sweet treat rich in flavour, why not look into making some jalebi yourself? It’s popular for a reason! Forget the calories – this sweet treat will give you a sugar rush like no other.